Most schools use textbooks to teach classes like math, science, history, and social studies. In the 2008-2009 school year alone, public schools spent $9,217,964 on textbooks (Department of Education Textbook Expenditures, SY2008-2009). Ideally, we could replace textbooks as needed each year, and teachers could use the same textbooks for the same classes they teach. But my father is a public school teacher, and he tells a different story. Instead, textbook publishers regularly print “new” textbooks with updated content, even for subjects that should seldom change, and charge more money to print the “old” textbooks. And it’s far too expensive to replace all the textbooks at the same time. One solution is to work with local printing companies to publish textbooks. We would ask for commitments to publish the same textbooks for a minimum number of years, perhaps even contracting with local writers, so that we do not have the same problem with replacing textbooks that we do now. Not only would this help our local economy, it would provide lower costs for textbooks in terms of production, shipping, and re-orders. 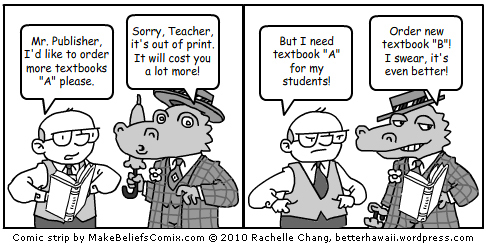 Another solution is to consider “print on-demand” textbooks. Digital printing technology allows companies to only print books when an order has been received – why not textbooks for our public schools? We could order only the textbooks we need, and the publisher would not have to store additional copies in their warehouse – or charge us more for “outdated” textbooks. A third solution is to use electronic books for small or advanced classes. eBooks are too expensive for all public schools classes, but we could try them in classes with a small number of students. School and public libraries already have computers that students can use, as well as eBooks that can be “borrowed” in EPUB, Mobipocket, and OverDrive Media formats. eBooks can’t be lost or damaged, and students would have fewer textbooks to carry around. Any money we save on textbooks would go right back into the schools – and the teachers, who are more important than textbooks. How else can we help our schools save money? In 2008, Hawaii hospitals provided $24,600,000 in charity care and lost $107,100,000 in payments that could not be collected. The total amount of charity care and bad debt is expected to increase in 2009 (“Hawaii’s Healthcare System – What Lies Ahead?” pages 16 and 21, Healthcare Association of Hawaii, 11/09). We can’t deny people life-saving health care, but we can start by expecting individuals to have honor and personal responsibility. Most people don’t want charity; they want a chance to give something back. Why can’t health care providers come up with alternatives to cash payments for lower-income families? * Create a Hospital “Welcome” program. A feeling of safety and warmth could help patients recover more quickly. Individuals could make hospitals more welcoming, by creating artwork for the walls, sewing chair covers, quilting covers, and adding personal touches to the rooms. * Create a Hospital “Greetings” program. With limited visiting hours and busy families, many patients feel lonely and bored. Individuals could visit children, the elderly, and those who are injured or sick and brighten up their days. They could read books, sing songs, and generally try to make other hospital patients’ visits more comfortable or lively. * Create a Hospital “Kupuna” program. Instead of “waiting to recover,” we could engage hospital patients’ minds and creativity. Individuals could hold classes to teach people to read, play a musical instrument, knit, paint, or speak another language. Just about anything! They just have to be willing to share their knowledge and enthusiasm. Let’s discuss more ways to turn charity care into an opportunity for personal responsibility and pride. The Hawaii legislative session cost $38 million in 2007, and was annually budgeted at $34 million in 2008, 2009, and beyond (FY 2011 Executive Supplemental Budget, page 3). That’s a lot of money for laws that try to keep us safe, but end up adding more regulations and paperwork. I know that we need laws and lawmakers, but do we need new laws every year? We could amend our state constitution to have a biannual legislature, one that meets every two years. Five state legislatures – Montana, Nevada, North Dakota, Oregon, and Texas – already do this. Why should we have a biannual legislature? * It would provide more time for discussion and public input. It’s not a full-time job, but legislators spend a lot of time meeting in committees and with the community, writing bills, reading proposed bills, and tracking of amendments. It’s even harder for “regular” citizens to keep up with all the legislation at the state and federal levels, so that we can offer our opinions and experiences. Why not take more time to think through proposed laws? * It would reduce the number of new laws. Every year, we just keep adding new laws, but how many of them expire? Laws can have good intentions, but unintended consequences – and costs. * It would save money. While we wouldn’t save $34 million every two years, we could save some money with limited staff and office expenses. If there is an urgent need for a law or amendment, the legislature could still call for an emergency session, just as they can do now. Of course, we would need to change the two-year term for Representatives to a four-year term, so that they can follow through with legislation. Why should we let State Representatives and Senators have longer terms? * It would save money on campaigns. In the 2008 election, the State House and Senate spent over $4.3 million to get elected – money that came from taxpayers, either through donations or public financing. * It would allow legislatures to focus on law-making. With four-year terms, Representatives would not need to campaign for the next election right after getting elected. I don’t know what effect a biannual legislature would have on Hawaii, and I’d like to hear what you think. Our neighborhoods and parks are coping with litter, graffiti, vandalism, and the homeless. Let’s set aside those challenges for a little while and think about neighborhood pride. With our busy lives, we’re losing our connection to our neighborhoods and to our history. If people don’t think of their neighborhood as a link to their family, they won’t take care of it. If children don’t think of parks as a link to their lives, they won’t care if they are vandalized. I’d like to propose that we create historic storyboards across the islands, not just at historic sites, but in our local communities and parks. What would this accomplish? Historic storyboards would teach us about Hawaiian history and culture. They would encourage community pride and care for the land. They would make sure that we remember and respect the past. 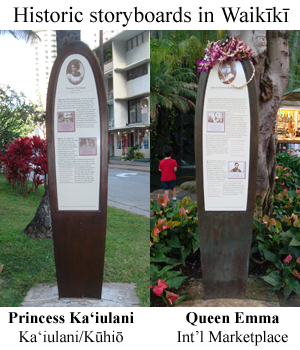 There are already historic storyboards across Waikiki that promote our history and make us feel proud of our cultural heritage. But we need a statewide program for neighborhoods and parks around Hawaii. The storyboards could follow the Waikiki design of an upright surfboard; or we could design single-panel or double-panel storyboards. With historic photos and illustrations, the panels could explain the region’s name, provide a history of a location and its cultural significance, and identify the people, businesses, and events that influenced the area. Some civic clubs in Hawaii are already working on this – the Ko‘olaupoko Hawaiian Civic Club http://www.koolaupokohcc.org started the Na‘oneala’a Project, to design and install a storyboard at Na‘oneala’a (Kaneohe Beach Park) recognizing the historic value and significance of the site. But we need a statewide initiative, partnering with neighborhood boards and civic organizations. It would be great if a Hawaiian community organization could take the lead. What do you think? With photography by Brett Uprichard and a foreword by Richard Chamberlain, Hawaii author Jocelyn Fujii profiles the extraordinary people and mom-and-pop businesses who have helped build Hawaii through the years in “Stories of Aloha: Homegrown Treasures of Hawaii” (2009). Fujii’s intimate and heart-warming profiles were originally published in “Spirit of Aloha,” the in-flight magazine of Aloha Airlines between 1985 and 2008, the year the airlines closed its operations. She also includes ten recipes from Aloha Airlines employees and five recent essays. On Kauai, I learned about Hanapepe Honey, gathered and packed by Hindu monks at the Saiva Siddhanta Church, which donates the honey to rebuild Hanapepe; and Hamura Saimin in Lihue, a family restaurant since 1951 that is famous for its saimin and lilikoi chiffon pie. On Oahu, I learned about Helena’s Hawaiian Food in Kalihi, serving homemade Hawaiian food since 1946, when Helen Chock began selling poi for 15 cents, pipikala for 25 cents, and laulau three for $1; Hoa Aina o Makaha, a 5.5-acre demonstration farm in Waianae started in 1979 by Gigi Cocquino, who teaches children about growing fruits and vegetables, tending animals, building imus, and respecting the land and each other; and Kaala Farms and the nonprofit Opelu Project’s Walter Paulo, who has been teaching traditional Hawaiian opelu fishing by canoe in Miloii, Waianae, as well as lauhala weaving, kappa making, taro growing, using medicinal plants, and other traditional Hawaiian activities. On Maui, I learned about the West Maui/Molokai Taro Farmers Association and Aimoku Pali, who are maintaining the traditional Hawaiian rural lifestyle and planting taro and koa trees in Honokohau. On Molokai, I learned about the Kanemitsu Bakery, founded in 1935 by Shigeo Kanemitsu, famous for its ‘Molokai bread’ and late-night ‘hot bread run’ at the back door. On Hawaii, the Big Island, I learned about Seaside Restaurant in Hilo, where the Nakagawa family has carefully tended a fishpond full of mullet, aholehole, catfish, golden tilapia, rainbow trout, carp, and papio since 1921; and Clay Bertelman and Na Kalala Waa Moku o Hawaii, who teach about celestial and ocean navigation, canoe making, Hawaiian values, survival skills, and Hawaiian music, chant, and dance. “Stories of Aloha” is personal, warm, and engaging, and nostalgic, with eloquent prose that emphasize family, community, and tradition. The people and families are full of humility, generosity, passion, dedication, and talent. I was saddened to read about some businesses closing and founders passing away, but delighted that so many businesses and traditions continue. Join a summer reading program! I encourage everyone to join one of the free summer reading programs at Hawaii’s public libraries. There are programs for all ages – children, teens, and adults – promoted by the Friends of the Library and corporate and community sponsors. So visit a library, read at least one book every week, and you could win a prize just for reading. Let’s invite everyone we know to sign up for a reading program too! For more information about the summer reading program and suggested booklists, visit http://librarieshawaii.org/programs/SUMMER.HTM. Wherever you stand on the marriage/civil union debate, and whether you choose to remain single, I think we can all agree that marriage is a good thing. Marriage gives children two parents who are committed to each other and can help with childcare and finances. Marriage offers emotional support. Marriage promotes strong social and community bonds. So how can we protect marriage — without spending a lot of money on tax credits or incentives? * Make marriage licenses more expensive. Yes, it seems like a paradox, but we want to promote marriages based on love, respect, and commitment – not impulse. * Encourage newlyweds. Couples marrying each other for the first time could receive a “welcome” box (like new mothers receive in the hospital) with coupons (for moving, storage, furniture, and restaurants) and booklets (about how to manage your money, buy a home, and household tips). * Recognize Crystal, Silver, Gold, and Diamond wedding anniversaries. Couples celebrating 15, 25, 50, and 75 years of marriage could be invited to a Mayor’s Anniversary Ball or Governor’s Anniversary Gala, with help from the wedding industry. The media could interview people and find out how they make their marriages work. * Add a divorce penalty for couples who are married less than two years. Unless there’s abuse or infidelity, we could encourage couples to stay married for at least two years by adding an additional fee to the divorce petition. * Make no-fault divorces more expensive, especially if there are children. If a no-fault divorce petition is more expensive, maybe couples will try a little harder, or take a little more time before giving up on their relationship. Marriage is worth celebrating. What else can we do to encourage marriage? You are currently browsing the Better Hawaii weblog archives for June 2010.